You can search for openings on your calendar where you can schedule appointments. On the Patient menu, under General, click (or tap) Appointments. On the Schedule menu, click (or tap) Search for Openings. If you are already viewing the scheduling calendar, on the Actions menu, click (or tap) Search for Openings. If you are viewing a patient's Appointments page, click (or tap) Search for Openings. The Search for Openings page opens. Set up the filters that you want to use to search for open time slots. Patient Search - The name of the patient whose record you last accessed appears by default; or if no patient has been selected since the last time you logged in, the field is blank. The name entered, if any, will be used by default on the appointment you schedule by using this search tool. To clear a patient's name from the field, click (or tap) the Remove button next to his or her name. To select a different patient's name, begin typing the desired name in the field to view a list of matches, continue typing to narrow the results, and then click (or tap) the appropriate name. Which Day of the Week - The Monday, Tuesday, Wednesday, Thursday, and Friday check boxes are selected by default. Select the Any day check box to include all days of the week in your search. Select or clear the check box of any day of the week that you want to include in or exclude from the search. Open times for only the specified days will appear in the results list. Appointment Duration - The 1 Hour option is selected by default. Select the length of time required for the appointment that you want to schedule. You can choose a length of time from 15 minutes to 3 hours, in 15 minute increments. Open times that are of the specified length will appear in the results list. Time Range - All is selected by default to include all times of the day in your search. Select or clear the check box of any time range (Early Morning, Morning, Early Afternoon, and Late Afternoon) that you want to include in or exclude from the search. 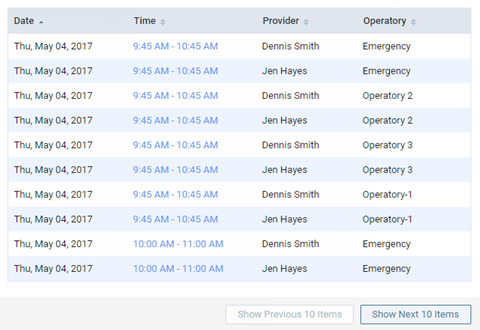 Open times within only the specified time ranges will appear in the results list. Which Appointment Providers - All is selected by default to include all providers in your search. Select or clear the check box of any provider who you want to include in or exclude from the search. Open times for only the specified providers (according to their working hours) will appear in the results list. Which Operatories - All is selected by default to include all operatories in your search. Select or clear the check box of any operatory that you want to include in or exclude from the search. Open times for only the specified operatories will appear in the results list. Note: You can click (or tap) Reset to put the filters back to their default values so that you can set up a different search. The first 10 results that match the specified criteria appear. Note: You can click (or tap) Show Next 10 Items to add 10 more results to the end of the list. As needed, sort the list by date, time, provider, or operatory by clicking (or tapping) the appropriate header. When you click (or tap) a header that is not already the one being used to sort the list, the list is sorted in ascending order by that column. Click (or tap) the same header again to sort the list in descending order by that column. Click (or tap) the Time link that corresponds to the date and time when, provider with whom, and operatory where you want to schedule an appointment. The Calendar page opens to the selected date.